We’d love your help. Let us know what’s wrong with this preview of Dragon Rider by Kay Berrisford. The road to Ben and Lyle's wedding is proving a bumpy one. Ben hasn't even told his family he's getting hitched to a shapeshifting merman, and he's not the only one worried. When Lyle's tearaway sister, Cully, whisks Lyle away on the merfolk equivalent of a stag do, she questions whether marriage is what Lyle needs anyhow. A merman should roam the seas and seek adventure, The road to Ben and Lyle's wedding is proving a bumpy one. Ben hasn't even told his family he's getting hitched to a shapeshifting merman, and he's not the only one worried. When Lyle's tearaway sister, Cully, whisks Lyle away on the merfolk equivalent of a stag do, she questions whether marriage is what Lyle needs anyhow. A merman should roam the seas and seek adventure, not work in an ice-cream parlour and worry about the rent. 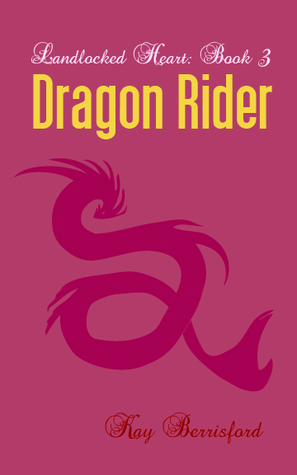 To ask other readers questions about Dragon Rider, please sign up. From that review: " For a series that started out as semi-humorous in nature (at least in my perception) Landlocked Heart is taking a nicely dark and interesting turn. It started in book 2, Lyle's Story, where we learned about Lyle's background, his torture, and the merfolk clan history. Not a pleasant one at that. Here, in Dragon Rider, we pick up at what should be the best time of Lyle and Ben's life, preparing for their wedding. However, it seems to be anything but. Ben hasn't told his family that, 'hey, I'm marrying a merman'. And Cully, Lyle's brother/sister arrives on the scene, never a good thing with Lyle's family." Things pick up pretty much where they left off. Ben and Lyle are still working at the ice cream parlor, and are very close to finishing their wedding preparations. There’s just one thing left on Ben’s agenda: his family meeting Lyle. But of course, things quickly go awry when Lyle’s sister, Cully, shows up suddenly, asking for Lyle’s help with some family matters. What I loved about this addition to the series was that it expands and adds several new plot elements. I won’t say what so as not to s Things pick up pretty much where they left off. Ben and Lyle are still working at the ice cream parlor, and are very close to finishing their wedding preparations. There’s just one thing left on Ben’s agenda: his family meeting Lyle. But of course, things quickly go awry when Lyle’s sister, Cully, shows up suddenly, asking for Lyle’s help with some family matters.